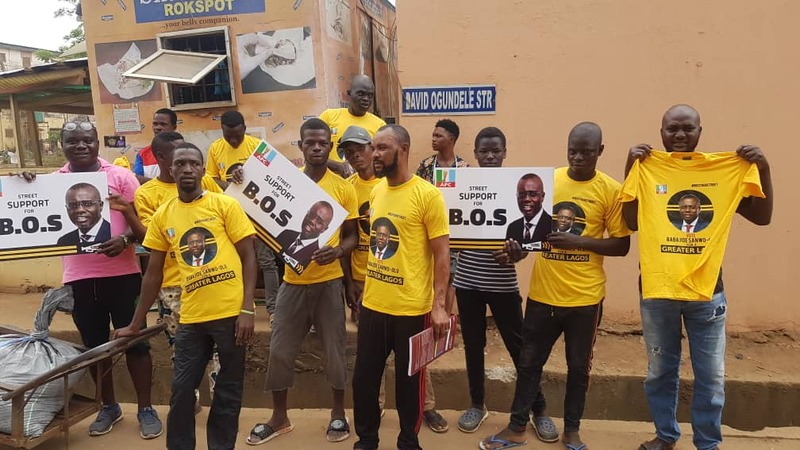 Ahead of the forthcoming governorship election in Lagos on March 2, 2019 hundreds of youths from the group known as Street Voices are storming the streets of Lagos in a house to house campaign tagged ‘BOS Your Street’. On Sunday 27 January, the young men and women with their aggressive street by street and door to door campaign for the gubernatorial candidate of the All Progressives Congress, Babajide Olusola Sanwo-Olu said they are committed to ensuring victory for the APC candidate. 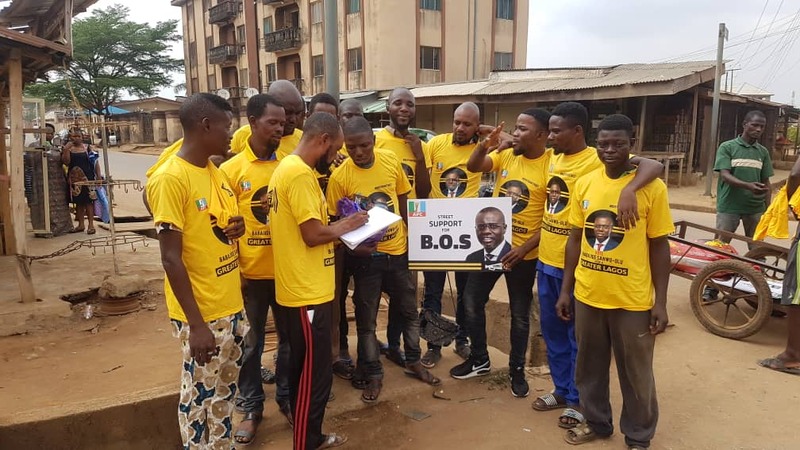 The youths were seen in their yellow customised campaign wears with souvenirs spreading the idea called “BOS Your Street”. They moved from house to house intimating Surulere people on seven great things about the person of the APC candidate, Mr. Sanwo-Olu. According to Mr. Rasaq Ivori – a Communication Strategist, who is behind the idea, he said that the campaign is targeted majorly at reaching out to well-meaning Lagosians, upwardly mobile people, students and the working class, who are scared about getting to campaign rally grounds as a result of anticipated violence and are undecided about who to vote for. Rasaq in a chat with newsmen explained how effective the concept had been since it was flooded on Twitter and other social media platforms few weeks ago. 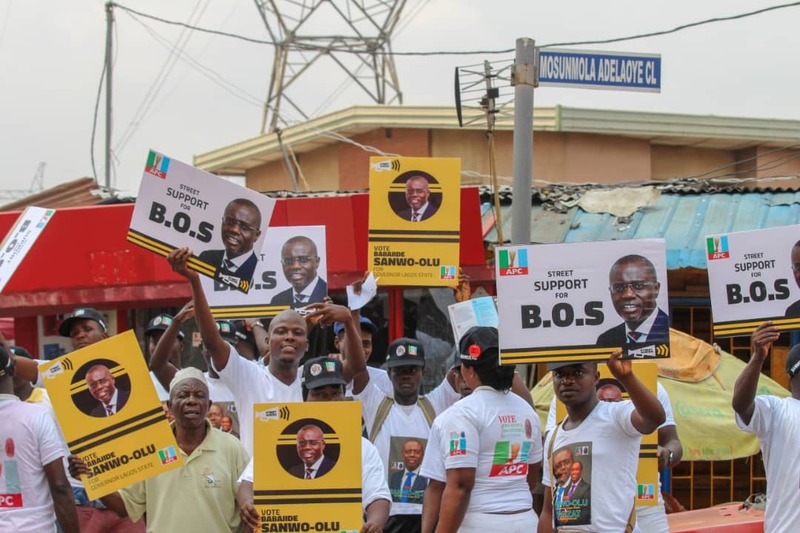 He said that the idea is a “Self Campaign” which involved retweets of messages shared about Sanwo-Olu by individuals on their handles and walls with their pictures #BOSYOURSTREET. The founder of Street Voices further explained that those people are subsequently provided with brand items which they can share on their particular streets. And the more they take pictures and share online, more people demand for their streets to be “BOSed” and the idea continues to spread to other areas. He said that so far over 7000 retweets and requests have been received from individuals in different locations across Lagos State. The ‘BOS YOUR STREET’’ campaign aside Surulere had been to Lekki, Somolu, Ikeja and other parts of the state.